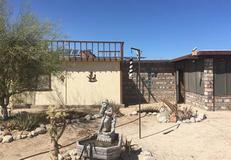 Well Maintained and Furnished Two bedroom Two bath home in Popular solar area of El Dorado Ranch, Newer Solar system, with two instant hot water heaters, a large screen room, work & tool detached shed and a roof top deck great sea and mountain views in San Felipe. This home is perfect for a second or winter home in the 24 hour manned security and Gated community of El Dorado Ranch. Has great amenities, Swimming Pools, tennis, Golf and Beach access. Its resort living with 2 open restaurants and scheduled activities. Sea and Mountain view. A must see. Master trust. 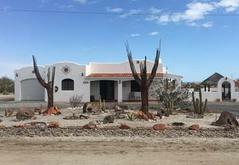 Beautifully furnished with Mexican style decor, fireplace and outdoor living Space. Multi use area El Dorado Ranch and can have a full time motor home on the Property. Nicely maintained and landscaped with outdoor living space and tandem garage. Entertain under the well build Palapa and BBQ ready for use. Roof top Deck for Star Gazing and Sun bathing and enjoy the 360 degree views of the Sea and Mountain terrain. The Washer/ Dryer, All appliances and gas range, ceiling fans and Land Line telephone stay with home. Gated Community with 24-hour security with Beach access, 2 Restaurants and Golf give this property that resort feeling to enjoy all year round.